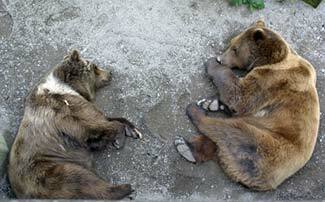 ABOVE: Bears take a nap in the city's Bear Park. INSET BELOW: Bear mascots are featured in statues and other symbols throughout the city. "The Bear's Den, near the Nydeck Bridge, is at the east end of Berne. Here are kept some specimens of bears at the public expense, according to ancient usage; and very unwieldy and uncouth specimens they are." Whatever be the real connection of the words 'bear' and 'Bern,' the figure of a bear occurs in the oldest known city seal (1224), and living bears have been kept in Berne at the town's expense since 1513 (except for a brief interval when the French removed them to Paris in 1798). Frommer's Switzerland describes the city's bears as "beloved, pampered, and fed by both residents and visitors." Everything is relative, of course, but when we first visited the historic Bern Bern Pits in 1975, we couldn't help thinking that the Bärengraben had more in common with Alcatraz than with the animals' natural habitat. For details about the Bärenpark Bern, including visitor information and photos, visit the official Web site at baerenpark-bern.ch. 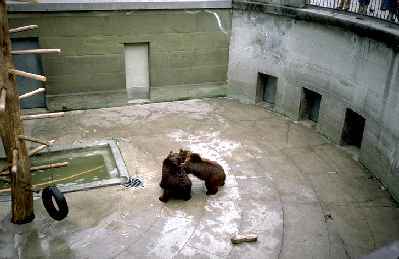 BELOW: The old and gloomy Bern Bear Pits, prior to the opening of the city's new BearPark in 2009. Top photo © iStockphoto/Andrea Baumgartner. Inset photo © iStockphoto/Becky Jo Tobin.